Glutamate decarboxylase (GAD) is the biosynthetic enzyme for the neurotransmitter γ-aminobutyric acid (GABA). 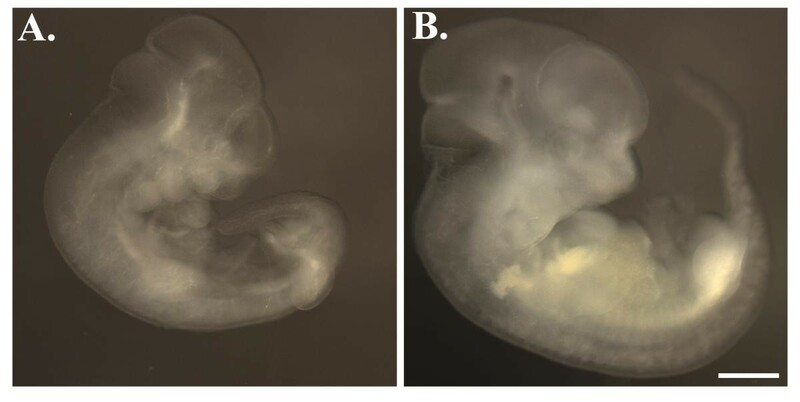 Mouse embryos lacking the 67-kDa isoform of GAD (encoded by the Gad1 gene) develop a complete cleft of the secondary palate. This phenotype suggests that this gene may be involved in the normal development of tissues outside of the CNS. Although Gad1 expression in adult non-CNS tissues has been noted previously, no systematic analysis of its embryonic expression outside of the nervous system has been performed. The objective of this study was to define additional structures outside of the central nervous system that express Gad1, indicating those structures that may require its function for normal development. Our analysis detected the localized expression of Gad1 transcripts in several developing tissues in the mouse embryo from E9.0-E14.5. Tissues expressing Gad1 included the tail bud mesenchyme, the pharyngeal pouches and arches, the ectodermal placodes of the developing vibrissae, and the apical ectodermal ridge (AER), mesenchyme and ectoderm of the limb buds. Some of the sites of Gad1 expression are tissues that emit signals required for patterning and differentiation (AER, vibrissal placodes). Other sites correspond to proliferating stem cell populations that give rise to multiple differentiated tissues (tail bud mesenchyme, pharyngeal endoderm and mesenchyme). The dynamic expression of Gad1 in such tissues suggests a wider role for GABA signaling in development than was previously appreciated. Glutamate decarboxylase (GAD) catalyzes the formation of the inhibitory neurotransmitter γ-amino butyric acid (GABA) from glutamate. In mammals, the two isoforms of this enzyme, GAD67 and GAD65, are expressed from two separate genes, Gad1 and Gad2 respectively [1,2,3]. GABA signaling plays several roles in neuronal development. Early in CNS development, GABA can modulate neuron progenitor proliferation as well as neuron migration, survival and differentiation [4,5,6,7,8,9,10,11,12,13,14]. In some classes of neural progenitors GABA stimulates these processes while in others it has an antagonistic activity. For example, recent work has demonstrated that GABA acts in the developing neocortex to stimulate the proliferation of progenitors in the ventricular zone while inhibiting the proliferation of progenitors in the subventricular zone . Later, during postnatal development, normal GABAergic input is required for activity-dependent plasticity in the visual cortex as shown in the Gad2 knockout mouse [15, 16]. In addition to these functions in the developing CNS, GABA signaling is also required for the normal development of non-neural tissues. Targeted mutations of the Gad1 gene lead to defective development of the secondary palate [17, 18]. The cleft palate phenotype of the Gad1 mutants suggests the involvement of GABA-mediated signals in the normal development and differentiation of a structure derived from the oral epithelium and neural crest ecto-mesenchyme. This conclusion is further supported by the similar cleft palate defect seen in mice with a deletion or targeted mutation in the β3 subunit of the GABAA receptor [19,20,21,22]. This intriguing genetic evidence indicates a role for GABA-mediated signaling in the development of a non-neural structure, the secondary palate. The potential for this pathway to be involved in the early development of additional non-neural tissues has not yet been thoroughly explored . To address this question, we surveyed Gad1 transcript distribution in the non-CNS tissues of the embryo. Using a whole mount in situ hybridization approach, we found that Gad1 is indeed expressed in a number of different regions and tissues. A notable feature of this expression pattern is that Gad1 transcripts accumulate in the specialized ectodermal structures that are involved in the formation of the mystacial vibrissae and in limb outgrowth. These specialized ectodermal tissues are known to be sources of developmental signals [24,25,26]. In addition, transcripts are expressed in the mesenchymal stem cell population of the tailbud and in the pharyngeal endoderm and mesenchyme. The expression patterns show that Gad1 is expressed in several non-CNS structures that are derived from each of the three germ layers of the embryo. The mouse Gad1 gene is widely expressed in the embryonic central nervous system . To define additional sites of expression outside of the CNS, we analyzed the distribution of Gad1 transcripts in E8.5 to E14.5 mouse embryos by whole mount in situ hybridization. Gad1 transcripts were not detected in E8.5 day embryos (data not shown). At E9.0 Gad1 was readily detected in the tailbud (figure 1A). Expression in the tail continued through E12.5 and was undetectable by E13.5 (figure 1B,C,D and data not shown), a period corresponding to secondary body axis formation in the mouse embryo . Examination of sections from an E9.5 embryo revealed a high level of Gad1 expression throughout the mesenchyme and neural epithelium in the caudal portion of the tailbud (figure 1F). No transcripts were detected in the surface ectoderm surrounding the tailbud mesenchyme (figure 1F). At more cranial levels within the tail, expression was localized to paraxial mesoderm, ventral neural tube, notochord and cells of the dorsal hindgut (figure 1E). In the paraxial mesoderm, the highest expression levels were also localized ventrally, adjacent to the notochord (figure 1E). Gad1 expression in the developing tail. (A-F) Gad1 expression in the tail from E9.0-E12.5. (A) Gad1 is strongly expressed in the tail at E9.0. At E10.5 (B) and E11.5 (C), the expression becomes localized towards the tip of the tail. (D) By E12.5 Gad1 expression fades. (E, F) Sections through the tail of an E9.5 embryo hybridized to the Gad1 probe prior to sectioning. The plane of section in (E) is cranial to that shown in (F). The hindgut (hg), neural tube (nt), tailbud mesenchyme (m) and neuroepithelium (n) are indicated. Scale bar: A-D 750 μm; E 75 μm, F 100 μm. In the pharyngeal region of E9.5 embryos, Gad1 RNA was detected in and around the second, third and fourth pharyngeal pouches (figure 2A). Sections through the third pouch confirmed the presence of Gad1 expression in the pouch endoderm (data not shown). Expression was particularly strong in the dorsal portion of this pouch (figure 2B). The additional diffuse staining appeared to be in the pharyngeal mesenchyme (figure 2B). The expression in the pharyngeal region was very transient; transcripts were easily detected at E9.5, but only faintly at E9.0 and were not detectable by E10.5. Gad1 expression in the pharyngeal region. (A) Expression in the pharyngeal pouches and arches (arrows). The first arch (1st A) and heart (H) are indicated. (B) Higher magnification of the third pharyngeal pouch illustrating high levels of Gad1 expression in the dorsal third pouch endoderm (black arrow) and diffuse expression in the mesenchyme caudal to the third pouch (white arrow). Scale bar: A 1 mm; B, 100 μm. In the limb buds, Gad1 RNA was detected from E9.0 to E11.5 (figure 3A,B,C,D,E,F,G,H). Transcripts were initially expressed in the pre-apical ectodermal ridge (pre-AER) at E9.5 (figure 3A,B) and by E10.5 were seen in the definitive AER of the forelimb (figure 3D). At E10.5 Gad1 was expressed in a diffuse stripe in the forelimb (figure 3D) while in the hindlimb expression was only detected in the apical ectoderm (figure 3E). By E11.5 forelimb AER expression was fading and expression was seen in a diffuse stripe in the proximal forelimb and a diffuse crescent in the proximal hindlimb (figure 3G,H). The earlier activation of Gad1 in the forelimb reflects the normal temporal order of events in limb development. Sections indicate that the expression within the limb buds was in surface ectoderm and adjacent mesenchyme (data not shown). Gad1 RNA was not detected in the limbs by whole mount in situ hybridization after E11.5. Gad1 expression in developing limbs. (A-H) Gad1 expression in the limb buds from E9.5 to E11.5. (A,B) Expression in the forelimb bud (arrow) at E9.5. (C-E) Gad1 transcripts in the developing limbs at E10.5. (C) Lateral view of E10.5 embryo indicating the forelimb (black arrow) and hindlimb (white arrow). Expression is seen in the proximal forelimb. (D) Higher magnification view of expression in the proximal forelimb (white arrow) and AER (black arrow). (E) Gad1 expression in the hindlimb AER (arrow). (F-H) E11.5 embryos. (F) Fading Gad1 expression in the forelimb AER (black arrow) and crecent-shaped expression in the proximal hindlimb (white arrow). (G) Higher magnification view of declining expression in the AER (black arrow) and strong expression in mesenchyme and ectoderm (white arrow). (H) Higher magnification view of the crescent-shaped expression pattern in the hindlimb (arrow). Scale bar: A, C 1 mm; B, D, E, G, H 500 μm; F 1.5 mm. A dynamic pattern of Gad1 expression was detected in the developing vibrissae from E12.5 to E14.5 (figure 4A,B,C,D,E,F,G,H). 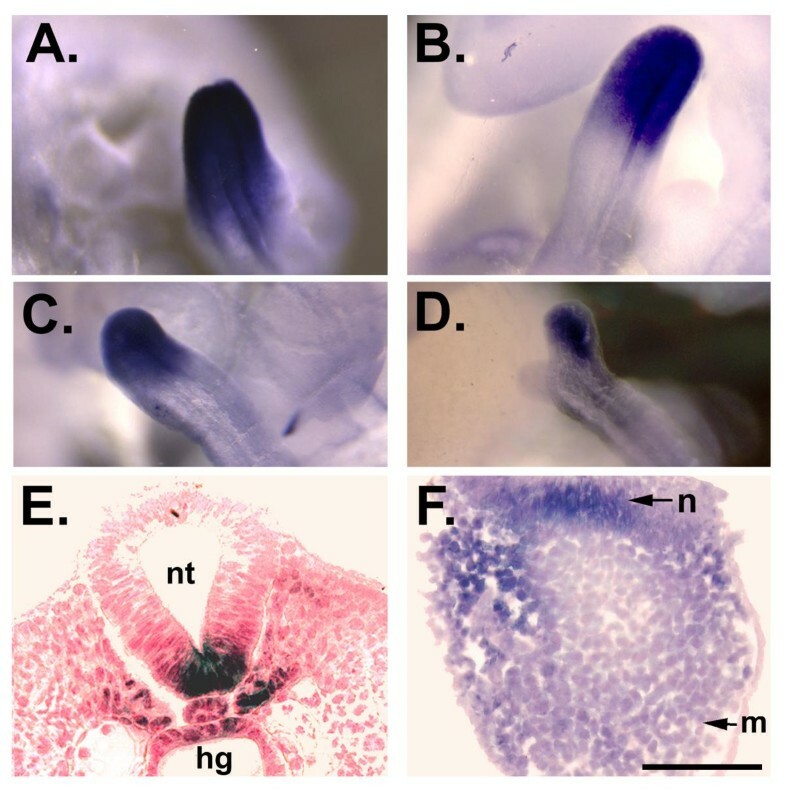 Expression was first detected in the supra-orbital, infra-orbital, and post-oral vibrissae and in the posterior vibrissae in the lateral nasal and maxillary rows (figure 4A,B; nomenclature as in ). Gad1 RNA was also detected in some of the posterior labial vibrissae at this stage. Expression was activated in a posterior to anterior (towards the nose) progression in the lateral nasal and maxillary rows, reflecting the pattern of vibrissal development . By E13.5, Gad1 expression was detected in the anterior lateral nasal and maxillary rows and was activated in the rhinal, labial and submental vibrissae (figure 4C,D). By E14.5, expression was strong in the labial, submental and rhinal vibrissae (figure 4E,F). 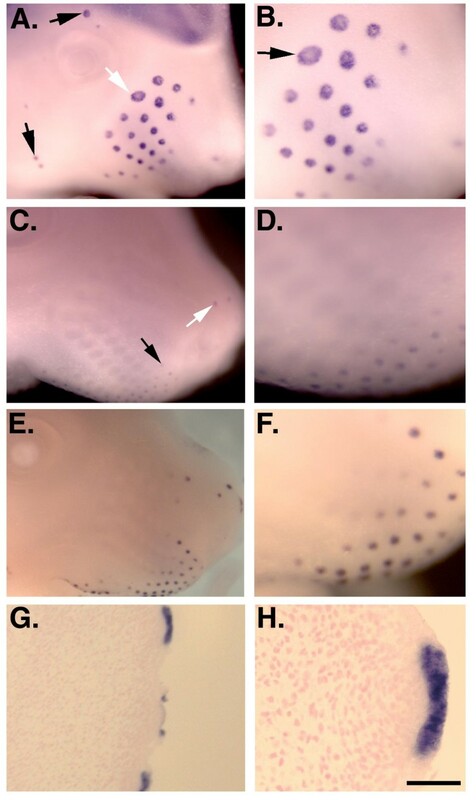 Sections of E12.5 whole mounts show that Gad1 expression was localized to the epidermal placodes of the mystacial vibrissae (figure 4G,H) and was maintained as the placodes begin to invaginate (figure 4G). Gad1 transcripts in the developing vibrissae. (A, B) Expression at E12.5. (A) Gad1 RNA in the supra-orbital (black arrow at top of panel), lateral nasal/maxillary (white arrow) and postoral (black arrow bottom of panel) rows of vibrissae are indicated. (B) Higher magnification view of lateral nasal/maxillary vibrissal rows. The placode corresponding to the β vibrissa follicle  is indicated. (C-F) Gad1 transcripts in the vibrissae at E13.5 (C, D) and E14.5 (E, F). 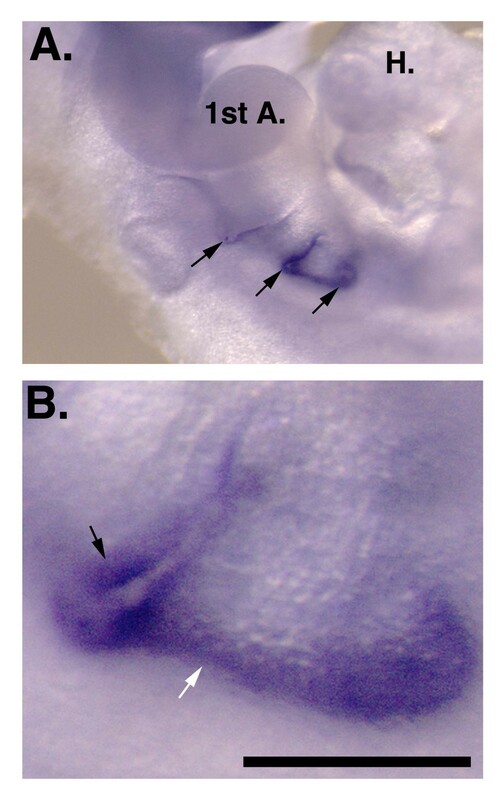 The initial faint expression in the rhinal (white arrow) and anterior maxillary vibrissae (black arrow) at E13.5 is indicated in panel C. (G, H) Coronal sections through the snout of E12.5 embryos hybridized to the Gad1 probe prior to sectioning. Scale bar: A, C, F 750 μm; E 1.5 mm; B 450 μm; D 400 μm; G 200 μm; H 25 μm. Control hybridizations using a sense strand Gad1 probe were also performed. Embryos hybridized to the sense probe did not reveal any staining pattern at any of the stages tested (E8.5- E14.5). Sense strand hybridization results for E10.5 and E11.5 embryos are shown in figure 5. Gad1 sense strand control hybridizations. Hybridization with the Gad1 sense strand probe resulted in no signal. (A) Sense strand probe hybridization to an E10.5 embryo. (B) Sense strand probe hybridization to an E11.5 embryo. Scale bar: 1 mm. The expression results reported here show that Gad1 was activated in several tissues outside of the central nervous system during mouse development. Transcripts were not seen at E8.5 and were first detected at E9.0. It was surprising that this very early phase of Gad1 expression was largely outside of the developing CNS and was localized in the tail bud mesenchyme and in the pre-apical ectodermal ridge (pre-AER) of the forelimb bud. As development proceeded Gad1 was detected in pharyngeal endoderm and in the ectodermal placodes of the vibrissae. The data demonstrate that Gad1 is expressed in several sites outside of the developing CNS and in derivatives of all three germ layers. We have also detected the expression of Gad1-lacZ transgenes in the developing vibrissae and limbs supporting the novel and surprising in situ hybridization results we report here (J.J. Westmoreland and B.G.C., unpublished results). Previous studies have shown that Gad1 can be regulated at the post-transcriptional and translational level. Gad1 mRNA translation or protein stability can be regulated in mature neurons by the level of GABA [30, 31]. During embryogenesis, post-transcriptional regulation occurs by alternative splicing during embryonic development in rats and mice [32, 33]. This alternate embryonic transcript inserts a stop codon into the Gad1 mRNA and can produce the truncated proteins, GAD25 and GAD44, from its 5'; and 3' ends respectively. The studies reported here used a probe that will detect the adult Gad1 mRNA that encodes GAD67 as well as the embryonic alternatively spliced mRNA that can encode GAD25 and GAD44. These additional mechanisms of Gad1 regulation may control the production of GAD proteins and the synthesis of GABA in the non-neural cell types detected in our study. The whole mount in situ hybridization data reported here extends the results of a recently published section in situ hybridization study on E10.5-E12.5 mouse embryos . Our analysis showed that Gad1 expression is first detectable earlier at E9.0 and revealed novel non-CNS sites of expression in the pharyngeal region, vibrissae, tail bud and limb bud. The results of the previous study , together with the data reported herein, provide a comprehensive picture of Gad1 expression in the E9.0-E12.5 mouse embryo. Previous studies have noted Gad expression outside of the CNS. In adults Gad1 and Gad2 have been detected in a number of tissues including kidney, testis, oviduct, pancreatic islets and adrenal cortex [34,35,36,37]. Previously reported sites of embryonic Gad1 expression outside of the brain and spinal cord during rodent development include the lens fibers and the olfactory pit [38, 39]. In E10.5-E12.5 mouse embryos Gad1 is expressed in the olfactory and the lens placodes, the anlagen of the olfactory pit and lens fibers . We also detected Gad1 expression in these tissues (please see figure 3A and data not shown). Expression of Gad in the developing heart and blood vessels has also been reported . We detected weak staining in the heart and did not detect blood vessel expression, perhaps due to the very low levels of expression in developing vasculature . Our results document localized expression of Gad1 at additional non-CNS sites in the mouse embryo, suggesting a potential role for GABA signaling in the development of these structures. Our interest in the role of GABA signaling in developing tissues outside of the central nervous system stems from the cleft palate phenotype of the Gad1 and the β3 GABAA receptor subunit mutants [17,18,19, 21, 22]. The genetic data strongly suggest that GABA acts through GABAA receptors to modulate the development of this tissue. 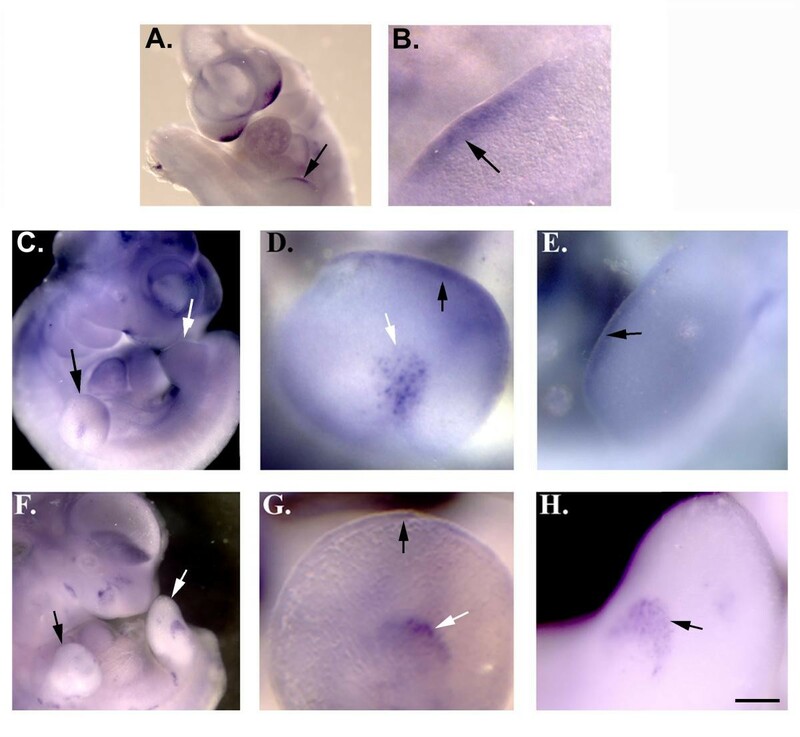 Although the data reported here do not explain the origin of the cleft palate phenotype, they do indicate that Gad1 is expressed in several additional non-CNS tissues in the mouse embryo. It is particularly noteworthy that these include the AER of the limb buds and the ectodermal placodes of the vibrissae. Both are ectodermal structures known to be sources of developmental signals required for morphogenesis and patterning [24,25,26, 40]. It will be of interest to examine the expression pattern of GABA receptors in the mesenchyme adjacent to these ectodermal signaling centers. Expression of GABA receptor subunits in adjacent tissues would indicate that these receptors read the developmental signals mediated by GABA in these structures and tissues. The mouse gene encoding the 67 kDa isoform of glutamate decarboxylase (Gad1) is expressed in the tail bud mesenchyme, vibrissal placodes, pharyngeal arches and pouches and the apical ectodermal ridge (AER), mesenchyme and ectoderm of the limb buds in mouse embryos from E9.0-E14.5. Some of the Gad1 expressing tissues (vibrissal placodes, AER) are known sources of developmental signals. Other sites of expression correspond to stem cell populations that give rise to multiple differentiated tissues (tail bud mesenchyme, pharyngeal endoderm and mesenchyme). The localized and dynamic expression pattern of Gad1 suggests a wider role for GAD and GABA in the development of non-neural tissues than was previously known. Whole mountin situ hybridizations were performed on Swiss Webster embryos as described [41, 42]. The morning that the vaginal plug was found was considered 0.5 days of gestation. The Gad1 probe was derived from an EST clone (accession W59173). Its 5' end corresponds to nucleotide 142 in exon 1  and the 3' end is at nucleotide 2041 in the cDNA sequence . Digoxygenin sense and antisense RNA probes were generated by labeling with digoxygenin-UTP during transcription. Embryos were removed and fixed in 4% paraformaldehyde/PBS overnight and used immediately for the in situ hybridization. The embryos were processed as described previously  and hybridized to the probe overnight in 50% formamide, 5X SSC (pH 5.0), 50 μg/ml torula RNA, 50 μg/ml heparin at 70°C. The final concentration of probe in the hybridization was 1 μg/ml. After an overnight hybridization, the embryos were washed at high stringency in prewarmed 50% formamide, 5X SSC, 1% SDS (wash I) at 70°C for 90 minutes. The embryos were then washed in a 1:1 mix of wash I and wash II (0.5 M NaCl, 10 mM Tris pH 7.5, 0.1% Tween 20) for 10 minutes at 70°C. The embryos were washed several times in wash II at room temperature to remove the formamide and then treated with 100 μg/ml RNase A, 100 units/ml RNase T1 in wash II for 1 hour at 37°C. Following the RNase treatment the embryos were washed in three changes of 50% formamide, 2X SSC pH5.0 at 70°C for a total of 90 minutes. Detection of the hybridized RNA probe was as described previously . The embryos were photographed without clearing using a Leica model MZFL III dissecting scope, a Hamamatsu model C4742-95 digital camera and Openlab 2.0.7 software. For sectioning, embryos were embedded in Immunobed (Polysciences) resin and sectioned at 10 μm. Sections were phtotographed using an Olympus BX60 microscope fitted with a SPOT digital camera (Diagnostic Instruments Inc.). We thank J.J. Westmoreland and Jyoti Koushik for performing some of the initial Gad1 in situ hybridizations and Drs. Nancy Manley and Audrey Napier for comments on the manuscript. This work was supported by a Medical College of Georgia Research Institute Grant and an MCG Biomedical Research Support Grant.